Jim and Peggy met at Bryan College in Dayton, TN and were married on June 30, 1973. They graduated from Bryan College the summer of 1974. Jim graduated with a Bible degree and Peggy with a Christian Education degree. After graduation they lived in the Dayton area until the summer of 1983. In 1982 they believed God was calling them into full-time Christian service. 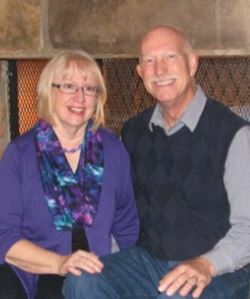 They joined the staff of Miracle Mountain Ranch in Spring Creek, PA in 1983 beginning a stretch of 24 years in Christian camping. 1992 God called them back to Tennessee to join the staff of Cedine Ministries in Spring City. They served the Lord there until December of 2006 at which time God brought them to CBM. Through the years God has blessed the Steeles with 6 children. Peggy is retired from Guest Services at Tuckaleechee Retreat Center and is currently serving in her local church. Jim oversees the grounds/landscaping of the Center.